The Ted Lindsay Award is a prestigious honour that identifies the “most outstanding player” each season as voted by his peers. 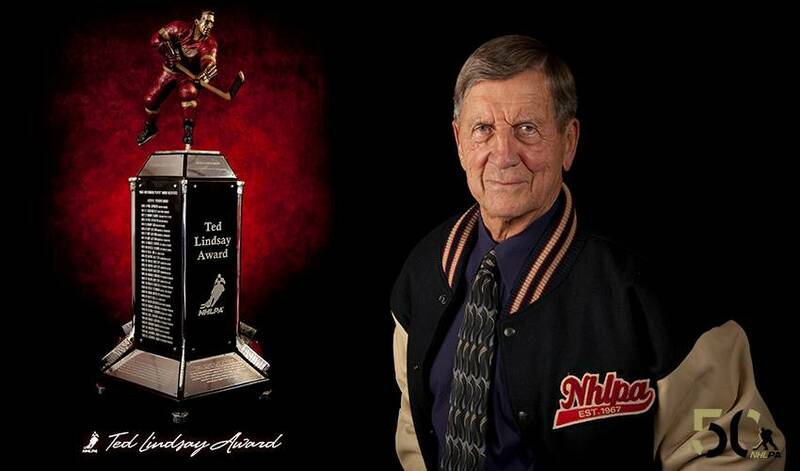 The players’ award is named in honour of Ted Lindsay, a key figure in the creating of the original National Hockey League Players’ Association in 1957, and a member of the Hockey Hall of Fame for his exceptional 17-season playing career, which included four Stanley Cup championships with the Detroit Red Wings. The Lester B. Pearson Award was reintroduced as Lindsay’s namesake on April 29, 2010. Lindsay was overwhelmed by the gesture. Lindsay always has been a fan of the players voting for a peer among them deemed to be the most outstanding in a single season. “The beautiful thing…is the players vote for it…and these guys know who the good hockey players are. I’m very honoured that they are the ones who decide who wins my trophy,” Lindsay said in April 2010, at the time of the announcement. "There are no politics involved. It tells you the whole story. Whoever wins it is entitled to it." The distinguishing criteria for the Ted Lindsay Award is that it is presented to the “most outstanding” player each season. In other words, the best player – as decided by his peers. Equally outstanding as its recipients is the award’s statue itself. The development of the physical Ted Lindsay Award was a labour of love, one that Lindsay, NHLPA staff and MST Bronze painstakingly crafted to the last detail, ensuring one of the most unique awards in hockey reflected the finished trophy. There have been 27 different recipients in the first 46 years of the award. Wayne Gretzky was voted the “most outstanding player” by fellow NHLPA members a record five times, Bobby Orr (1974-75) remains the sole defenceman to receive the award, and Patrick Kane (2015-16) was the first U.S.-born player to take home the Ted Lindsay Award. “There are so many great awards, but you can say that maybe this is the most respected…” Kane said to NHLPA.com at the 2016 NHL Awards upon receiving the players' vote. “It’s voted on by your peers and by the players of the NHL who are out there every night, playing against you and playing with you. They see up close and personal what you do as a player…Out of the two awards [Hart and Lindsay], this was the award I was hoping to win and most nervous for. One of those names was 2014-15 recipient, Carey Price. He was only the third goaltender to receive the players’ vote, behind Mike Liut (1980-81) and two-time recipient Dominik Hasek (1996-97,1997-98). “It’s very special to me because it’s voted on by the guys who you compete and battle against all season long,” Price told NHLPA.com after receiving his first and only Ted Lindsay Award to date. Three-time recipient Sidney Crosby called it an “honour” after he received his first players’ award in 2007, and after receiving his third award in 2013-14, added that having Lindsay himself on-hand to the present the award elevated the experience into a cherished moment. The award’s most recent recipient, Connor McDavid, echoed these sentiments. The NHLPA and its members continue to pay tribute to Lindsay – the first President of the Association – by annually presenting its outstanding player in his name, an honour that only continues to grow in meaning by a great deal to both Lindsay and the award’s recipients. The Ted Lindsay Award was originally known as the Lester B. Pearson Award, which was established in the 1970-71 season in honour of the former Canadian Prime Minister who also coached the University of Toronto Varsity Blues hockey team. As a means of preserving the legacy of the Lester B. Pearson Award, the NHLPA Goals & Dreams program and the family of the Rt. Hon. Lester B. Pearson joined together in 2011 to donate 55 sets of hockey equipment to the northern Ontario community of Kasabonika Lake First Nation. “Having represented a northern Ontario riding, Lester B. Pearson would be delighted that the NHLPA was making a donation of hockey equipment to First Nations children in the far north,” said Landon Pearson at the time of the donation, a representative of the Pearson family and the co-chair of the North-South Partnership. “Terrible Ted” Lindsay, born in Renfrew, Ontario, was inducted into the Hockey Hall of Fame in 1966. It was the culmination of a storied career full of on-ice accomplishments that paralleled the sacrifices he made to better the game for those who came next. He played in a combined 1,201 regular season and playoff games, won the 1949-50 league scoring title and was at his best in the playoffs having scored 47 goals and 96 points in 133 career postseason outings. As the left winger on the Detroit Red Wings’ famed Production Line with Sid Abel and Gordie Howe, Lindsay was a First Team All-Star an impressive eight times, and saw his No. 7 jersey raised to the rafters at Joe Louis Arena in 1991. While Lindsay’s exceptional playing career in Detroit is well known, it was his involvement in starting the original National Hockey League Players’ Association in 1957 that led to him being traded to Chicago as punishment by management. The once proud captain had been shipped to one of the bottom-feeding teams in the pre-expansion NHL, a Blackhawks team that had only been to the playoffs once in the previous 11 seasons. Lindsay played three seasons for the Blackhawks, helping lead them to the postseason in his final two years with the club. 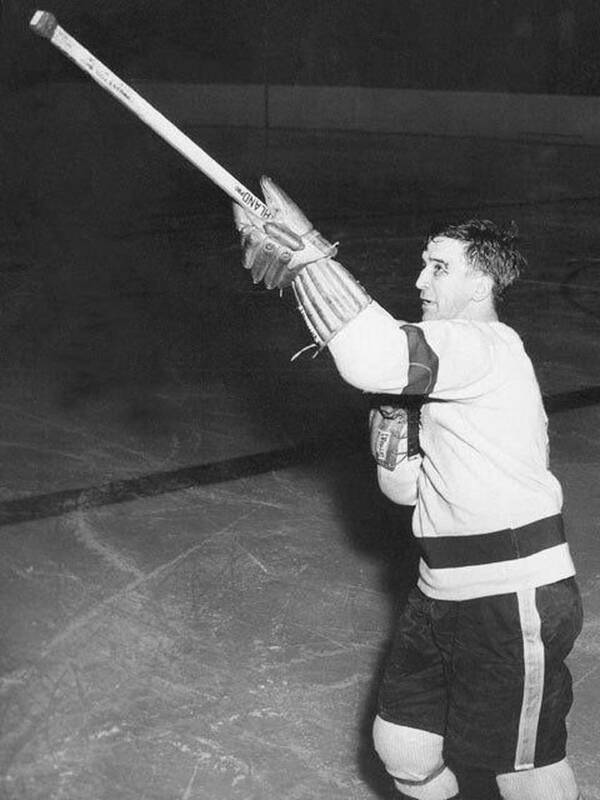 Lindsay announced his retirement following the 1959-60 season, and after a few years away from the game, Lindsay yearned to represent the winged wheel once more. Though he was after a colour commentary job, he was invited to return to NHL ice by former linemate Sid Abel, who was then the Red Wings’ general manager and coach. Lindsay couldn’t resist, and went on to lace them up again to play his final season in 1964-65 before retiring for good at the age of 39. Lindsay later went on to eventually serve as the Detroit’s coach and general manager. Standing five-foot-eight and weighing 168 pounds, Lindsay accumulated 1,808 career penalty minutes in addition to his impressive offensive statistics, and was regarded pound-for-pound as one of the toughest players to suit up in the NHL. A famous incident that occurred at Maple Leafs Garden didn’t help abate the moniker. During a semifinal series between the Toronto Maple Leafs and Red Wings March 24, 1956, an anonymous caller phoned in a threat to a local Toronto newspaper ahead of the Game Three matchup, warning that he planned on shooting Lindsay and Howe if they played in the game. The end result? Lindsay and Howe fearlessly took to the ice and combined for three goals in a victory for the Red Wings. Lindsay himself found the back of the net twice, including the game-tying goal to force an extra frame before he also played the overtime hero with the 5-4 decider. If the scoreboard wasn’t enough for the last laugh, “Terrible Ted” had, what he called, “a bit of ham” in him, and used his stick to do all the talking for a final time that night. “I took my gun,” motioned Lindsay, referring to how he we pointed his stick, “and went around in a circle like it was a machine gun – there were a lot of boos before I did that [scored the game-winning goal], but a lot of Toronto fans quit booing. Thought maybe they think I had a good sense of humour. Ted Lindsay loved hockey fans and is widely considered to be the first player to lift the Stanley Cup and skate around the rink to celebrate the championship, having done so with the local supporters at Olympia Arena in 1950 – a wonderful tradition that the players still act out more than 65 years later. “When the Cup was being presented at centre ice, they never had parades back then… the parade was back to the dressing room,” Lindsay said at the time the NHLPA reintroduced the player award in his name. “I saw the Cup standing there and all of these people were still around, hanging around the boards. I just thought, I went over and picked up the Cup…and took it by them. As one hockey tradition began with Lindsay, so fell one that was antiquated. With No. 7’s induction to the Hockey Hall of Fame in 1966, Lindsay though honoured, declined invitation to attend the ceremonial banquet. The rationale behind the decision? What was then an all-male affair precluded the attendance of some family members that Lindsay felt supported him throughout his career. The next year, the event became open to men and women. Today, Lindsay, can be found imparting his stories and wisdom through various independent appearances and NHLPA-related events, including the annual presentation of the Ted Lindsay Award. He was also a special guest at the 2017 edition of the NHLPA Golf Classic. At 92 years old, Lindsay still resides in the Detroit area, and has dedicated his life outside of hockey to the advocacy of Autism Spectrum Disorders through the Ted Lindsay Foundation. The Foundation has raised of $4 million throughout yearly events since its inception in 2001. Sidney Crosby: "It's A Huge Honour"